Don't bother searching for your health insurance card. A hospital in Allentown is testing a new way to confirm that you are who you say you are. WHYY reports on a biometric technology that is more distinct than a fingerprint or DNA. At the Lehigh Valley Health Network, more than 1,500 patients agreed to have their palm scanned when they showed up for blood work and other medical tests. Josh Napua is a vice president with the device manufacturer, Fujitsu. 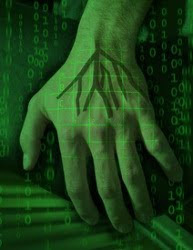 Napua: So instead of having a card that you can lose, or a social security number than someone can steal, what you can do as an option to indentify yourself now, is put your palm over a a scan that actually reads the palm veins. The scanner matches each palm signature with an electronic health record. Hospitals are testing the technology to prevent insurance fraud and reduce both clerical and medical mistakes. Lehigh Valley IT manager Fred Armbruster says some patients were wary at first. Armbruster: With any kind of biometric identifier, the public perception is very important. It can be perceived as a Big Brother type initiative. Fewer than 15 hospitals around the country have tested the palm scanner, so far. Napua says patients like he self-service kiosk. Napua: Whether it's getting cash from the bank or whether it's checking into your flight, you want to be able to allow the customer to serve themselves and not be hassled, if you will, by another human being. A lot of people prefer that. Armbruster says the device uses a nearly infrared light, similar to the beam from a TV remote control, to scan a patient's hand. Armbruster: When that scans it shoots infrared light onto the palm. That light is reflected off of the veins in the palm, the blue blood actually returning to the heart. To the human eye that would look like a tree in your pallm. To the palm scanner it converts it to a binary string kind of like a bar code, a series of ones and zeros. Armbruster says it took education and reassurance to get some patients to offer up their palm.